Yesterday was a beautiful day with just a hint of fall in the air, so I made some seafood gumbo for dinner. 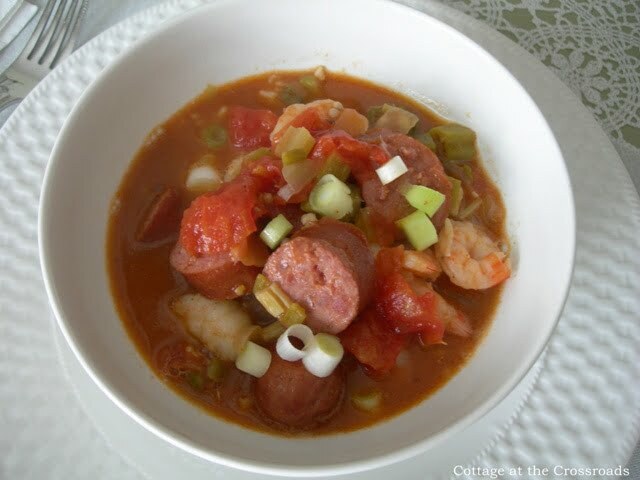 The word gumbo is derived from several African words for okra, and it has been used to thicken stews for centuries. And because we have plenty of okra growing in our garden, I decided to use it in making gumbo. 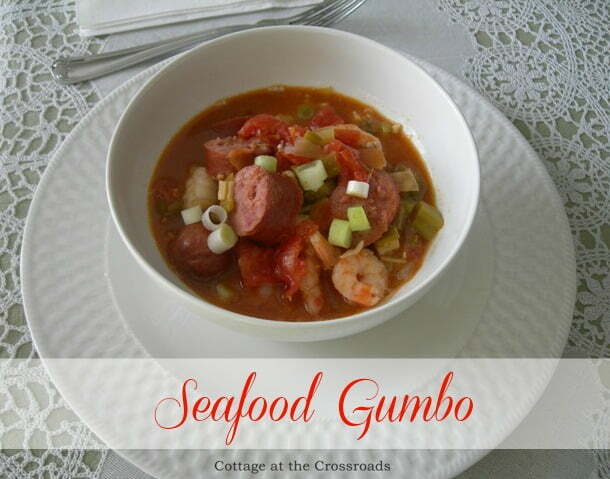 Gumbo is a traditional Louisiana dish, but it is found throughout the South. It is a thick, dark soup containing a mixture of vegetables, meat or seafood. 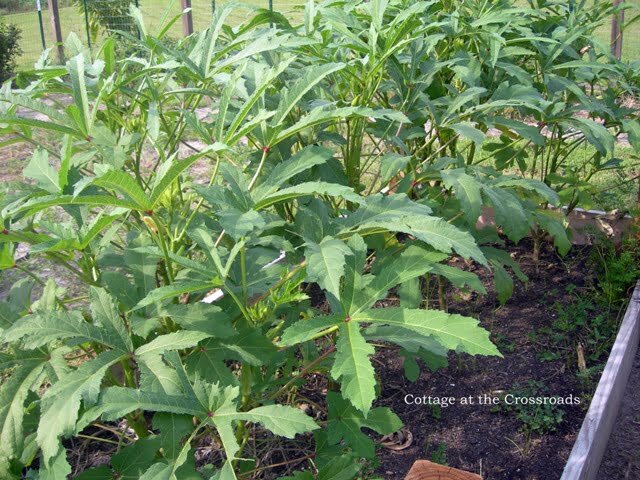 It is double-thickened with a dark roux and either okra or file powder. It is almost always served over rice. To get started making this gumbo, you are going to need some shrimp. You can use either fresh or frozen, but if you’re using frozen, go ahead and set it out to thaw. 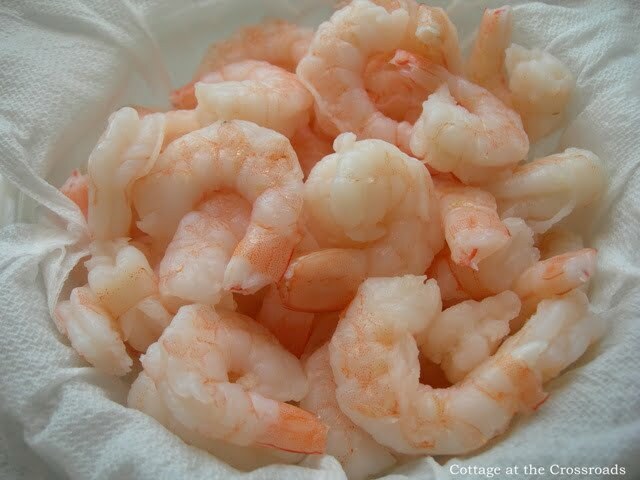 If you are using fresh shrimp, save your peels to use in making a shrimp stock. I actually save mine and freeze them to use in making stock later. Since I was using frozen shrimp yesterday, I pulled a bag of frozen shrimp peels out of the freezer and made a shrimp stock for my gumbo. All I did was put the frozen peels in a pot with 6 cups of water. I added about 2 tablespoons of Old Bay seasoning to the pot and brought it to a boil. Next I reduced the heat and let it simmer for about an hour. Then I removed the shells from the stock and set the pot aside. Now, if you don’t want to go to all that trouble to make your own stock, then you can use 6 cups of chicken stock. Have I told you that I can’t use chicken stock at my house? Leo is allergic to chicken and all fowl. Yes, I know. Very strange and very limiting, but he has to avoid chicken in any shape or form. Now you know why I make my own shrimp stock! 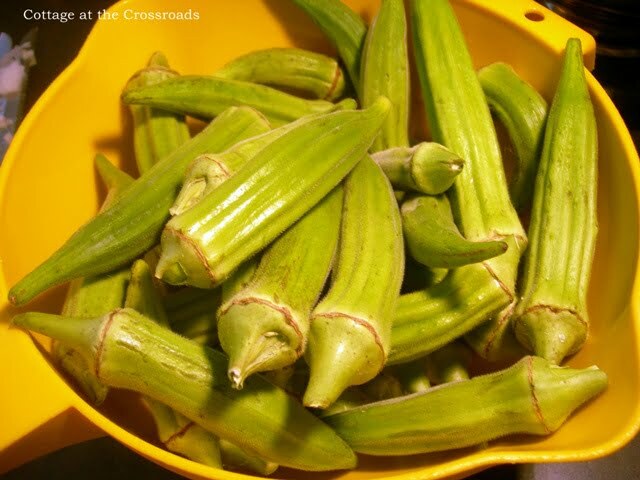 Next, you will need to wash and cut up about 4 cups of fresh okra. Add 2 tablespoons of olive oil to a large stockpot, heat on medium-high heat, and cook the okra for about 10 minutes, stirring occasionally. 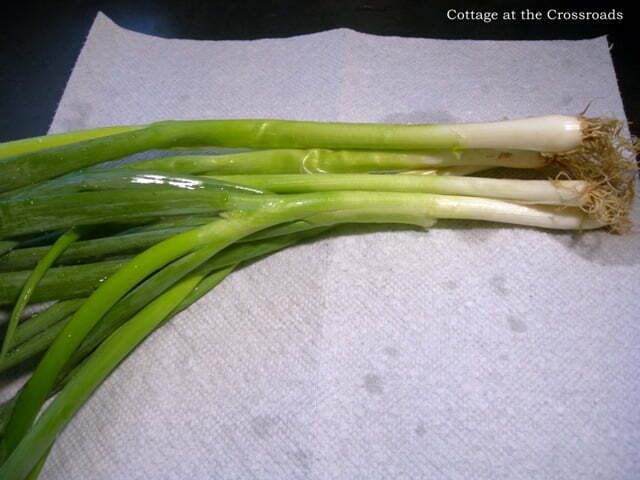 Stir in 1 onion, 3 garlic cloves, 2 stalks of celery, and 1 large green pepper, all chopped. Cook for at least 5 more minutes until the vegetables are tender. Add 2 tablespoons dried thyme, 1 teaspoon cayenne pepper (or a little more if you like things spicy), salt, and black pepper to taste. Stir in your stock (shrimp or chicken) and add 3 cans of diced tomatoes. 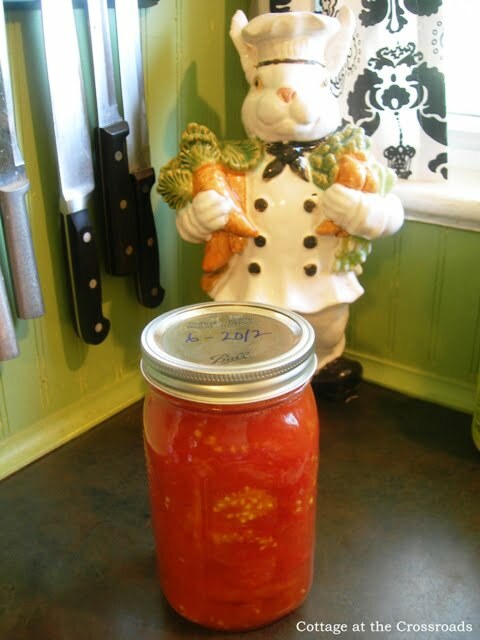 ( I used 1 quart of my own canned tomatoes.) Continue to cook for 10 minutes, stirring frequently and scraping any little bits of cooked vegetables from the bottom of the pot. To make a true gumbo, you must make a roux. If you are unfamiliar with the term, a roux is just a mix of oil or butter and flour. It acts as a thickening agent, and its dark color adds both flavor and color to the finished gumbo. 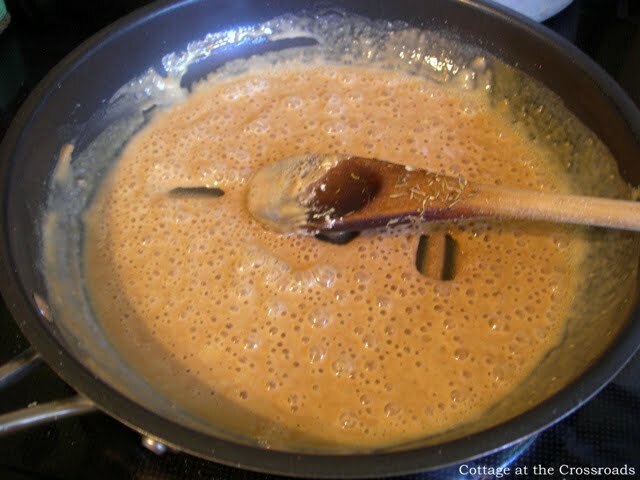 So to make the roux, melt 4 tablespoons of butter in a skillet over medium-high heat. Be really careful not to burn the butter! Next, gradually add 4 tablespoons of all-purpose flour to the melted butter, stirring or whisking to combine the butter with the flour. The important thing about a roux is that the amount of butter to flour must be the same. For example, if you increased the amount of butter to 5 tablespoons, you would have to increase the amount of flour to a matching 5 tablespoons. 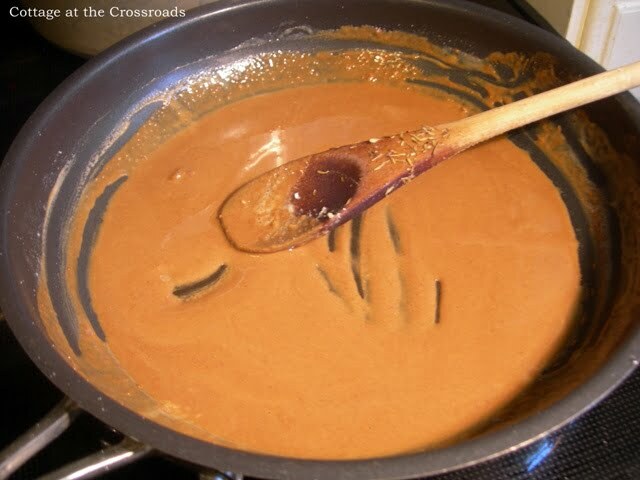 Reduce the heat and cook the roux for 15-20 minutes, stirring frequently, until it is thick and dark brown. Transfer the roux to the stockpot and stir to combine everything together. 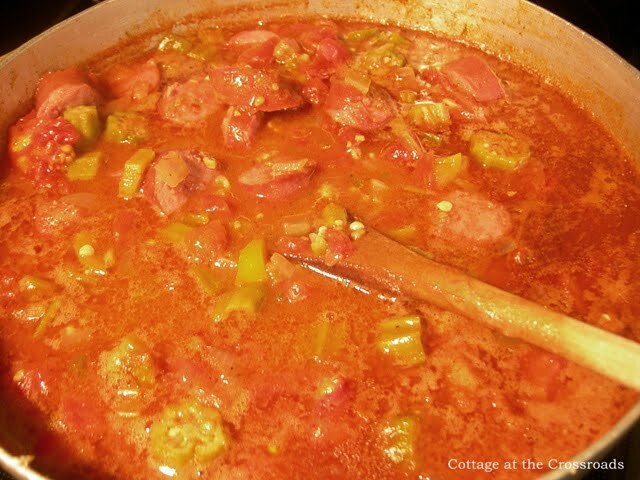 The next thing that makes this gumbo really good is smoked sausage. 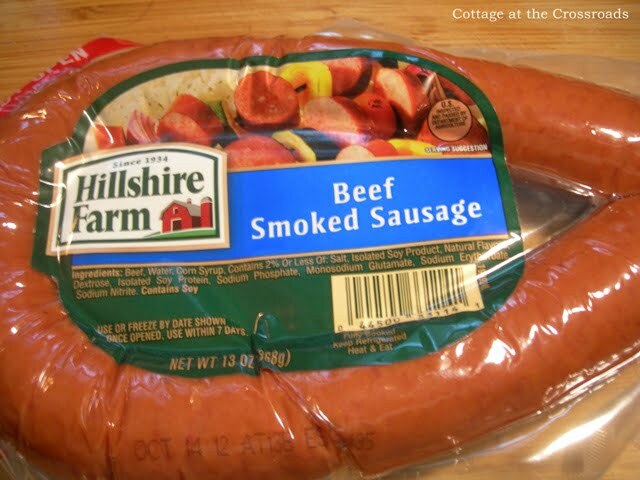 I add 2 packages of this kind of smoked sausage. Remember Leo’s chicken allergy? 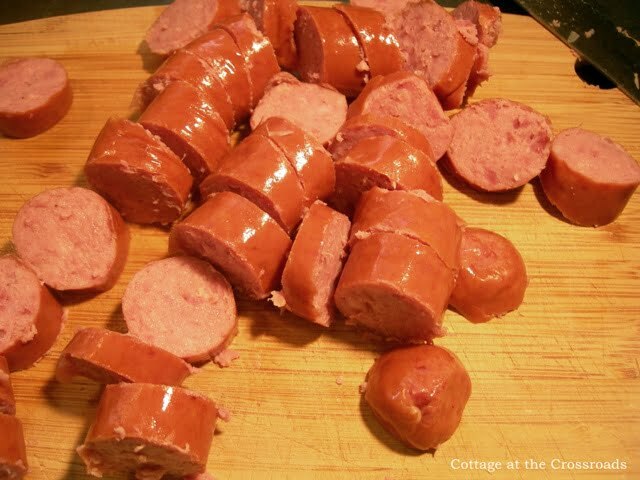 I have to use all beef smoked sausage because so much of it contains chicken! Cut the sausage into rounds and add it to the stockpot and bring it to a boil. Reduce the heat, cover, and simmer for 45 minutes. Meanwhile, prepare your rice according to package directions. Most people use white rice, but we use brown rice because it is nutritionally better. Immediately before serving, add your shrimp to your gumbo. Bring it to a boil, reduce the heat and simmer it for 1-3 minutes until the shrimp are pink and opaque. Remove the gumbo from the heat. Ladle your gumbo over rice in a bowl. Add some chopped green onions as a pretty garnish. Grab a bottle of Tabasco and dive in! Woowee! Dat good! If you’d like a printable version of this recipe, click HERE. I will have to try that. I am allergic to Cayenne Pepper. As a northerner I never exactly knew what gumbo really was. This looks delicious. I don’t let myself eat it very often but I LOVE sausage so this would be right up my alley. Great photos too. Where’d you get that cool font? we made this over the weekend and it was awesome!!! we opted to make the shrimp stock since it was something we had never done before and it was swingin!!! I am making this wonderful gumbo!!! Beautiful photos… can I make this without okra? I’ll substitute somethings! I would love you to join me for ON THE MENU MONDAY, my weekly linky foodie/recipe/menu party. I hope you will come over with your great recipes and share them with us… party going on now!!! Yum, yum, yum. Great comfort food. I could go for a bowl right now. Oh your gumbo looks awesome. So yummy!! This looks so fantastic Jane…YUM!~ Thanks for sharing the recipe. Looks simple too! YUM! and I love love love your bunny chef! Jane, this looks delicious! Now I am definitely in the mood for some gumbo. 🙂 And your canned tomatoes look amazing! Is this what I’ve got to look forward to when I come to the Southern Bloggers Conference? I’m all for that! 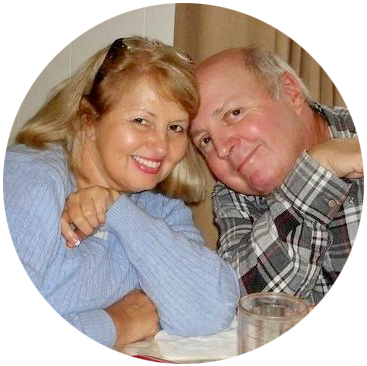 What a great recipe…love the tip on the okra…as I am not a fan of slimy okra…learn something new every time from the two of you!!! My family loves gumbo. We also eat a lot of fried okra. For those that say okra is slimy in stews. Add it frozen, this stops it from being slimy. Thank you for sharing your recipe for this yummy goodness at Potpourri Friday at 2805! Jane, this sounds awesome, never had made it homemade. I love gumbo especially shrimp. Thanks for sharing.